Another nice spring day. Another great opportunity to eat outside. J got another suggestion from a co-worker about a great spot to diner outdoors in the Vine Neighborhood. Cosmo’s Cucina is on the corner of Vine and Locust Streets in a 110 year old building that has housed a number of different businesses over the years. Cosmo’s is actually on the top floor of the building. The bottom is O’Duffy’s Pub. Parking is at a premium near this neighborhood bar. There isn’t much of a parking lot, so most patrons will end up on the streets surrounding the business. We were lucky enough to find an open spot not too far from the front door. The front door. I assume it’s the main entrance, but there’s a thick, metal gate that fences off a few outdoor tables on the ground floor. That’s not so odd, but the gate doesn’t open when you push on it. You have to reach around back and find the latch. We both entered and exited that way and both times I was wondering if we were going the right way. You enter the business in the pub area. That space alone is really nice and a little out-of-place in the neighborhood, but that’s the theme for the both restaurants. We headed through the bar to a stairway in the back corner which leads up to Cosmo’s. The upstairs space is pretty similar to the downstairs as far as decor. It has a natural wood floor that is probably original to the building. It’s one of those floors that have a lot of character. To get to the main dining room, you have to go up a narrow staircase and walk down a pretty narrow hall. When you get to the end, there’s a hostess station right next to the door that leads to the upstairs patio. We waited a few minutes to get recognized. When the hostess came out, she asked if we wanted to sit outside. J told her we’d like to if there were any open tables. Lucky for us, there was one left. The outdoor patio is just that. It’s a deck that’s built off the second floor of the building. It’s accessible from either inside or a staircase that leads to the back parking lot. The deck wraps around the building in an L-shape. The only table left was a six top around the bend and out-of-site of the main dining area. We were left with menus and silverware and told someone would be with us shortly to bring us water. Shortly wasn’t the term I would have used. It was quite a while. A waitress did finally show up with water and the specials menu which the hostess forgot to grab. We both put in drink orders for Coke’s but before the waitress could walk away, J noticed a special for mojito’s and changed her order to a mango mojito. Again, it took a long time for the waitress to come back with just my Coke. J’s drink came a few minutes later. The menu at Cosmo’s is a little more upscale. Good for J. Not quite as good for me. J didn’t have a problem at all finding something she wanted. In fact, she found two things. She started with the Martha’s Vineyard Salad. 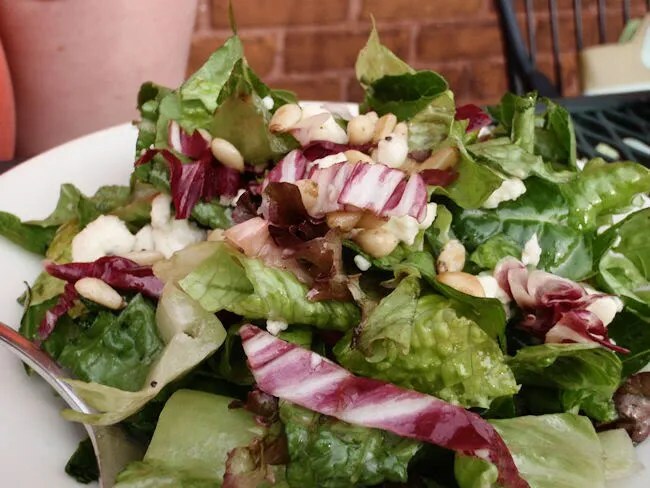 A bed of mixed greens is topped with red onions, Gorgonzola, pine nuts, and a raspberry vinaigrette. She went without the red onions which is nothing unusual. The salad is a side salad size and wouldn’t have worked as an entrée on its own. She was really happy with the salad and liked the use of pine nuts of the cheaper nuts usually on similar salads. 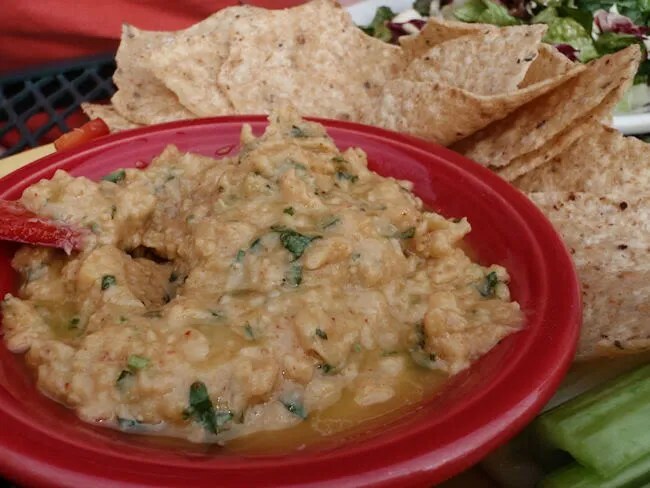 To go with her salad, she got an order of Spicy Chile Hummus which is served with veggies and corn chips. She mentioned the hummus was delicious, but not very spicy. She’s usually pretty sensitive to spicy foods. The serving size of the hummus is more something that could be shared, but I’m not a fan, so J had it all to herself. As for me…well, that’s a long story. I looked over the menu and there’s was nothing on there that really jumped out. There were a couple of dishes that I could eat and probably like, but I didn’t want to spend a bunch of money on something that didn’t sound great to me. The menu for the pub downstairs, that’s more my thing. I figured it’s the same kitchen, so maybe I could order off that. I used J’s iPhone to find the menu on O’Duffy’s website then asked the waitress when she came back. She said no. They don’t allow that upstairs. To me, it’s just saying that don’t want the trash upstairs that eat hamburgers. They have an image to maintain. But hey, it’s their image and they can do what they want with it. They did have a burger on the menu at Cosmo’s, but it wasn’t something I got 100% excited about. The Special Burger is two Angus ground beef patties topped with sautéed chili peppers, roasted corn, Portobello’s, cilantro mayo, cheddar, and pico de gallo. 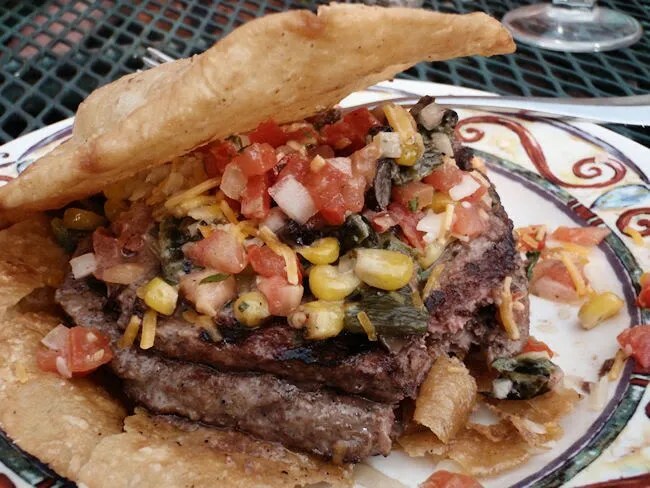 The burger is served between two crisp corn tortillas. The tortilla part of the sandwich was really a cool idea and something I really liked. Again, it shows what kind of clientel they’re going for though. It’s fancier than what I really wanted which is a little disappointing because the hamburger was really good. It had a char-grilled taste to it and I just wanted to keep eating it. I scraped a lot of the topping off to the side and used the tortilla as a spoon. Just the deep-fried tortilla and the hamburger made for a pretty delicious meal. The creation looked fantastic on the plate. It’s one those dishes that makes a great visual impact and the taste backs it up. The menu said the “sandwich” is served with Jalapeno chips. They didn’t come out when the waitress brought our food. She said she was going back to get them. I was really surprised when she threw a bag of chips at me and even more surprised when they were just plain chips. I couldn’t have a bacon cheddar cheeseburger, but I was served run-of-the-mill, out-of-a-bag chips. It seems like they would maybe do something a little more gourmet or at least give me the Jalapeno chips that were on the menu. Our bill came to right around $30 which is pretty good considering J’s drink was over six bucks. The meal took about an hour because it seemed like the waitress was working the whole deck by herself. After paying, we headed back downstairs and headed out the same door we came in. On the way out, we walked by some people eating in O’Duffy’s. 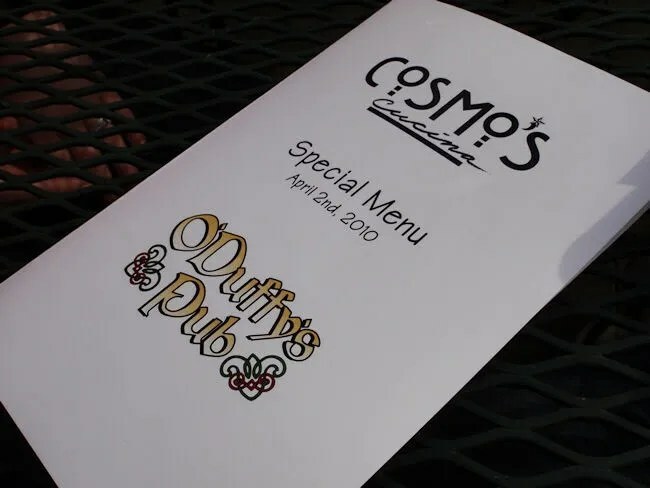 They had menus for both Cosmo’s and O’Duffy’s, so apparently, you can order from Cosmo’s downstairs, but you can’t order from O’Duffy’s upstairs. We’ll remember that next time. 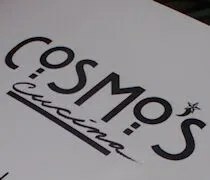 I know it sounds like I didn’t like Cosmo’s, but that’s not the case. The food was actually very good. I’m just a little turned off by the attitude of not being able to order from the pub menu upstairs. If you couldn’t order from the Cucina menu downstairs, it wouldn’t bother me as much. 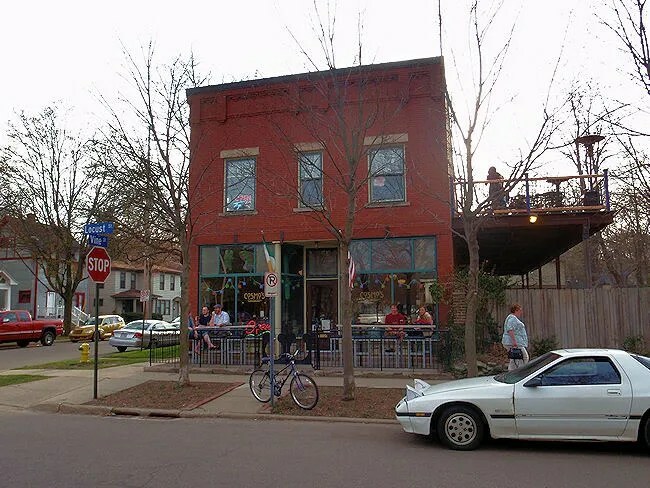 In reality, Cosmo’s Cucina is a hidden gem inside this neighborhood. We both liked the food. J more so than myself, but it’s more of her kind of place. The atmosphere is great. It was a perfect day to sit out on the deck, but even if you do sit inside, you’re not going to be cheated. The place has a charm that you can only get from a 100-year-old building.